The author Toni Morrison once offered the following wise advice: "If there's a book you really want to read but it hasn't been written yet, then you must write it." I have recently been in touch with the authors of three recent art books who all seem to have followed Morrison's counsel: each of the three books presented below has been born from genuine passion and curiosity. Rather than reviewing these books -- all of which are on my bedside table in various stages of being read -- I asked their authors to tell me a bit about how and why it needed to be written. * * * Grupo Antillano: The Art of Afro-Cuba (English and Spanish Edition) Edited by Alejandro de la Fuente Published by the University of Pittsburgh Press (2013) 348 pages This bilingual (English and Spanish) volume offers the first comprehensive study of Grupo Antillano, an Afro-Cuban visual arts and cultural movement that thrived between 1978 and 1983 and which had has previously been erased from Cuban cultural and artistic history. "I have always believed that there is no better antidote against amnesia than several pounds of printed pages: If they are illustrated, even better. 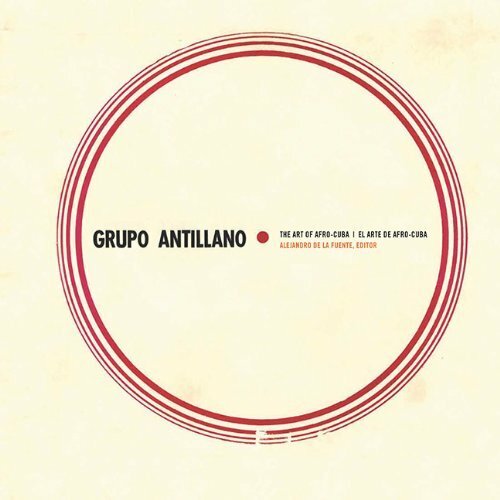 Grupo Antillano was erased from the annals of Cuban, Caribbean, and African Diaspora art. 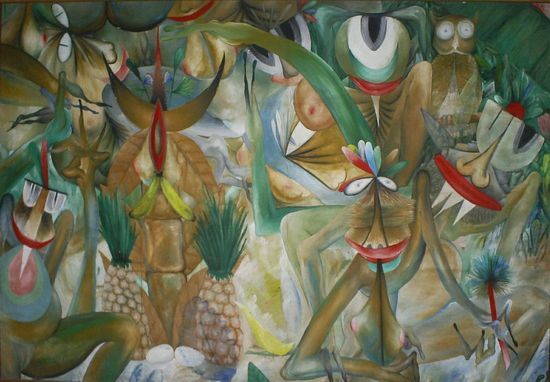 Their important contributions were ignored by art historians and critics, who never made reference to Grupo Antillano when discussing the "new Cuban art" that emerged in the 1980s. This book, which is based mostly on the rich personal archives of Grupo members, is their revenge." Manuel Couceiro, Untitled, c. 1970: Photo by Alejandro de la Fuente Alejandro de la Fuente and Donald Rubin at The 8th Floor Gallery, New York "I never thought that the book would grow to become what it is now. I wanted to write a small monograph discussing the place of Grupo Antillano in Cuban culture. But when I discovered what they had done, their level of activity, and the richness of their work, I knew that I had to do something else. I think the best moment during this whole process came when I took the first copy with me to the island and began showing it to them. I will never forget their reactions, their faces. The second best moment came when we managed to send several hundreds of copies of the book to Cuba, to be placed in libraries and art schools around the country." The works of Grupo Antillano can be seen in the exhibit Drapetomania: Grupo Antilano and the Art of Afro-Cuba, currently at The 8th Floor in New York City. It will then travel to the Museum of the African Diaspora in San Francisco in the fall of 2014 and will also be shown at the new Ethelbert Cooper Gallery at Harvard University in 2015. * * * Van Gogh's Untold Journey Revelations of Faith, Family, & Artistic Inspiration by Dr. William J. Havlicek Published by Creative Storytellers (2010) 366 pages Largely based on Van Gogh's letters, "Van Gogh's Untold Story" provides new insight into the artist's true character nurtured by his abiding faith, the influence of family, and the tender solicitude he felt for mankind. The net profits from the sale of Van Gogh's Untold Journey are pledged to The Endangered Child Foundation. "The book was conceived as a doctoral dissertation for a degree in philosophy using the letters of Van Gogh to illuminate late-19th century European thought. As the book evolved it became a spiritual portrait of the man Van Gogh set firmly into the context of his era which conversely overshadowed much of the early 20th century, given Vincent's impact on modern art. All of this became deeply poignant to me as a practicing painter facing many of the same questions about the value of art that Vincent wrestled with in his own time. Several years later after completing my Ph.D. what had once been a scholarly thesis was much expanded co-edited into everyday language by a small team of copy editors who to my delight helped me transform what had been been a theoretical project into a compelling family story with artistic practice at its center." 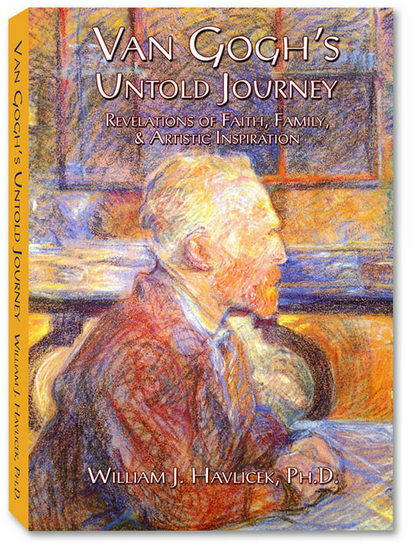 Dr. William Havlicek "Certainly one of the most important discoveries of the book was my proving the origin of the formal language and theme of the iconic "The Starry Night," found in a critical passage in Victor Hugo's "Les Miserables". We know Vincent and Paul Gauguin were reading the book at the time painting was made. Solving the mystery of the origin of this work was a life-changing event for me, given the enormous importance of this painting. Not a single art historian has ever challenged my findings on this work, in fact I have only received support and affirmation for the discovery. 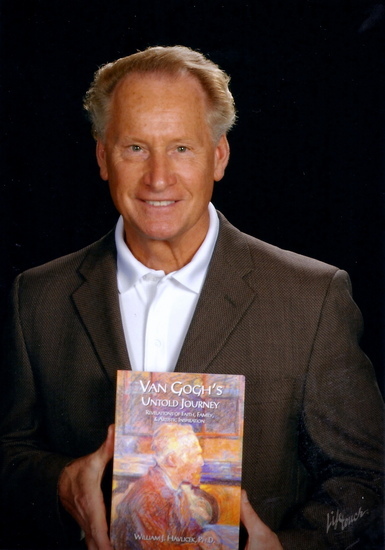 Van Gogh's Untold Journey, has been widely praised, as can be seen on Amazon -- where it has a 5 star rating with 19 reviews -- and on reader's comments on the Creative Storytellers website. We are especially excited at how well the book has caught on in Europe in eBook and vBook form given that interior space is limited for physical books in cites like London, Florence and Berlin." Lecture: Dr. Havlicek will be presenting a lecture about his book at the Studio Gallery in Irvine, CA on April 26th at 7:30 PM. For more information and/or reservations please contact Studio Gallery. 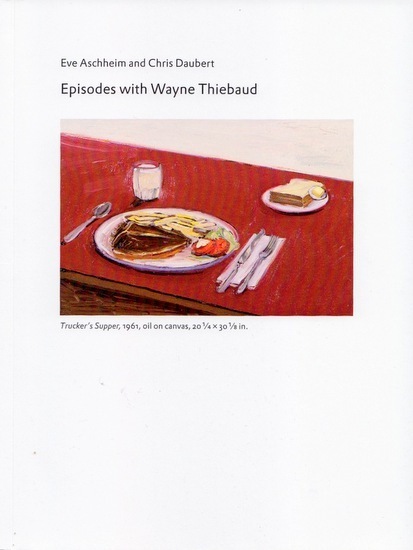 * * * Episodes with Wayne Thiebaud by Wayne Thiebaud, Eve Aschheim and Chris Daubert Published by Black Square Editions (2014) 96 pages Eve Aschheim interviewing Wayne Thiebaud, June 2010: Photo by Chris Daubert In Episodes with Wayne Thiebaud, Eve Aschheim and Chris Daubert -- two of his former students -- interview Wayne Thiebaud in four extensive conversations recorded at the artist's studio. "Having known Wayne for so many years, and reading most of the published interviews with him, we are very pleased to have captured the tone of his voice. It is a singular, Western American, deeply erudite, but at the same time, an amazingly informal voice - stunningly knowledgeable and experienced, but at heart, the voice of a storyteller of the old school, which comes through in the book. During the editing process we were able to study that voice and appreciate his thinking more acutely. Our various interview recordings were each transcribed differently, by a professional service, a student, or by a voice recognition program. Each time there were numerous errors to correct. For example, Barnett Newman would appear as "Barn at Noon". Before the final edit, we again listened to the original recordings and revised the text, at times deleting phrases. For example, the text had Wayne stating de Chirico is "just like a tattoo on the mind." In fact, the voice recording had "I think he's one of the most indelible kind of painters--you know, you just can't get him out of your mind. Just like a tattoo." The first statement would have been too hyperbolic for Wayne to make, and too harsh a metaphor. He doesn't think that way. Although he believes in caricature in painting, some form of exaggeration, in thought he is very careful, paying close attention not to overstep what can be said and still be true. In both, he balances accuracy with the strangeness of things. Over the two years we conducted the interviews, there were many times that we found ourselves, surrounded by a museum's worth of canonical paintings, listening to the stories about the Cedar Bar and de Kooning and Diebenkorn, that we felt Art History collapsing back to its rightful place: the story of art being made by artists. Wayne's sense of time emerges as he speaks about Diebenkorn or de Kooning, often in the present tense, as if they were still alive, while referring to many other figures in the past tense. It was a thrill to see Wayne in action, running (actually running) across the studio to answer the door, miming the relationship between a brushstroke to a tennis stroke, and many more instances of genuine laughter than could be incorporated into the book. We thought the interviews would answer all our questions about Wayne, but every time he answered, and every time we reviewed the text, several new questions emerged. Wayne often disavows the association with the Pop Artists, but in these pages he reveals the influences of popular culture on his work -- from Krazy Kat to the theatrical lighting of Hollywood, as well as the techniques of illustration, sign painting and advertising, showing his alertness to the visual environment of his time. His ability to integrate a range of influences from all levels of culture and historical periods in art, combined with his self-consciousness -- he makes a pastel drawing of pastels, or a paints a rack of postcard reproductions of paintings-- make him postmodern by definition. Through the interview it became clear that Thiebaud's process of openness, of letting so many influences into the work, while maintaining his changing set of ambitions, is truly inspirational."